This is what standing up to hate looks like—and it's a huge win for courageous student and community organizers who knew they were risking their own safety by taking action. 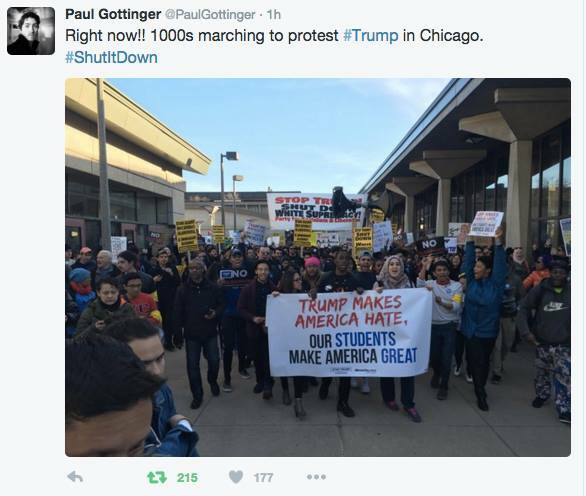 Everywhere Trump goes, his hateful and violence-inciting rhetoric needs to be met with this kind of outpouring of peaceful opposition. Everyone needs to see the image of this protest and get ready to stand up to Trump's hate in communities across the country. Can you share this image right now to make sure this is covered far and wide? Click here to share this image over Facebook—or click here to share it over Twitter. Together we can make sure that love trumps hate. In Chicago and in the entire country. Want to support our work? MoveOn member contributions have powered our work together for more than 17 years. Hundreds of thousands of people chip in each year—which is why we're able to be fiercely independent, answering to no individual, corporation, politician, or political party. You can become a monthly donor by clicking here, or chip in a one-time gift here. It seems that Freedom of Speech is only allowed if you're a democrat!